Our ductless air conditioning and heat pump systetms are made for the homeowner who wants the same reliable heating and cooling as larger homes but the flexibility to do it in spaces where ductwork is not an option. 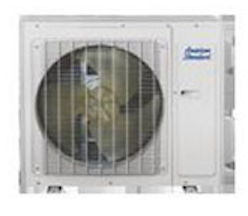 American Standard Heating & Air Conditioning ductless systems consist of an outdoor unit connected to an indoor unit mounted on the wall or in the ceiling. Mini-split systems can heat or cool a single room to perfection, while multi-split systems can give up to five rooms the comfort you desire, all at the touch of a remote control. It’s the right amount of comfort to fit your space. American Standard high-efficiency indoor ductless units offer our most powerful combination of speed, performance and efficiency, with features like turbo function and intelligent defrosting. Timer allows you to set when and how the ductless mini-split heat pump operates. Durable exterior features a new, strong hot-dip galvanized steel grill to help prevent damage and not affect airflow. Intelligent defrost works automatically to improve the system’s efficiency and helps you save power. A multi-split system lets you control up to five indoor zones independently and allows for easy future expansion.